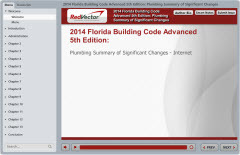 RedVector is proud to release two new courses on the Florida Building and Residential Code. The content in this course is written by Mr. Joe Belcher, who has more than thirty-five years in the code development and enforcement field. The Florida Building Code 5th Edition went into effect June 30, 2015. There are numerous changes in the base code, as well as Florida specific amendments to the base code, which regulates the design, construction, testing, and operation of plumbing systems. This interactive online course summarizes some of the significant changes in the Florida Building Code-Plumbing. This course is intended for those familiar with the code and desiring to update their knowledge base on the changes in these important regulations. Any designer, contractor, supplier, inspector, plans examiner, or other person involved with plumbing systems, whether they be commercial or domestic, will benefit from keeping current with the regulations governing their profession. At the end of this course, you will be able to distinguish between plumbing fixtures and appliances that efficiently preserve the health, safety, and welfare of citizens; determine whether Canadian Standards are acceptable; establish where temperature and pressure protection is required on hot water systems to protect against scalding; establish whether bundled piping complies with the code; recall whether or not public garages are required to provide toilet facilities to the public; determine where service sinks are required for businesses and merchants; ascertain if liquid type lining materials are permitted for showers. This is a video course developed in partnership with the International Code Council (ICC), and is presented by John Farinelli, CBO, MCP, CFM, LEED AP. Mr. Farinelli has over 30 years’ experience in the construction field and in building code administration. 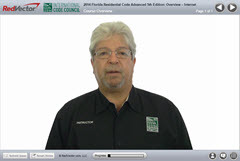 This interactive video course examines basic concepts of the 5th Edition (2014) Florida Building Code, Residential. It provides a basis for the correct use and application of the code and builds on an understanding of the intent of the code through practice with real-world examples. By the end of this course, you will be able to explain the fundamental provisions of the 5th Edition Florida Building Code Residential; locate general topics and applicable tables in the 5th Edition Florida Building Code Residential; define terms essential for correct code interpretation; and identify the code changes that relate to the design, construction or inspection of residential buildings.